Even if your old fridge miraculously keeps on working twenty years later, it doesn't mean that it will last until the end of time. Unfortunately, the task of removing this heavy, rusty piece of antiquity and replacing it with the latest model on the market is not as easy as it may sound. The same rule applies when you need to deal with new dishwashers, washing machines, tumble dryers, or any other modern kitchen units – there are just too many things that could go wrong if you decide to take matters into your own hands. 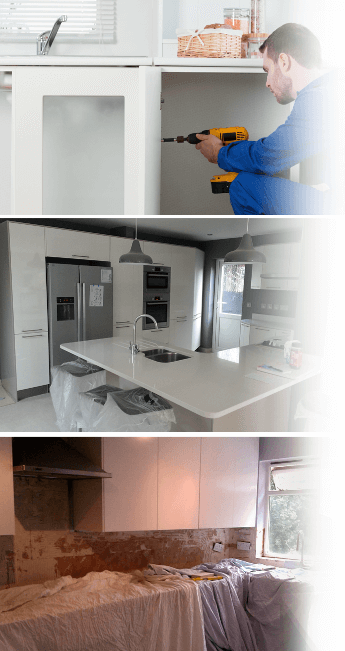 Q: Why count on Fantastic Handyman for a foolproof white goods installation? Finding a place for your appliance is just the start, because you will also need to have the proper tools and skill set to actually put it to good use. And if you don't know the first thing about plumbing, then we suggest to let the specialists at Fantastic Handyman handle this delicate task for you. The pros have lots of experience with fitting all types of electricity connections. The team will also follow the manufacturer's instructions word for word and will ensure that your appliance is connected to a suitable water supply. Q: How will a qualified expert be able to help me with my fitting kitchen project? A: When fitting a washing machine or any other white goods appliance on your own, you can easily end up with a leaking product that will cost you lots of money to repair. But with an efficient specialist at your disposal, you will have your kitchen appliance up and running in no time. The professional will decipher the elaborate instructions for you, keep track of every stray piece of hardware, and even neatly dispose of your previous appliance to free up a bit of breathing space. Q: How will the kitchen appliance installation services be carried out? Provide you with a helpful maintenance Q&A session for your individual appliance. Q: Will your appliance installation service include all necessary components? A: If the job involves installing a tumble dryer, a washing machine, or fitting an integrated dishwasher, then some suitable cords, exhausts, pipes, or other potentially needed parts are needed. If they are included in the original packing, we can use those. Q: What if I have a question that is not included in this FAQ? A: If you are still left with unanswered washing machine installation questions, make sure to get in touch with our polite and knowledgeable advisers. You can contact them over the phone, our real-time chat, via the online booking form, or even our GoFantastic app. Our customer support is available 24/7 and is always ready and willing to help you pick the services you need the most. Q: Can you provide me with a reliable estimated time of arrival? A: The handymen's estimated time of arrival is about an hour, depending on traffic. If possible, they will carry out your appliance connection service on the same day of your booking, as long as you have called us in advance. If they cannot visit your property at your desired hour, the experts will make sure to arrive at your doorstep on the very next day.